Sambor Town For a nice ride through the countryside hugging the Mekong River, you can head north past Phnom Sambok and past the dolphin site. About 24 km from the Globe circle, you come to a fork in the road. The road to the right goes to Stung Treng, but you want to follow the road to the left. This is the better of the two roads and the one that hugs the river to Sambor town, another 11 km away. Stay left at the fork as you near the town and you wind your way to Wat Sambor, located near the river. The front temple is fairly new, with a one hundred-year-old temple just beyond the rear of that temple. The town is pleasant and food, drinks, and fuel are available. As for the ruins shown on the official Cambodia map (south of Sambor), there is nothing left of them any more. Just one good- luck stone is all that the locals saved, putting it in a thatched temple hut a kilometer off the road. Wat Sray Sahn-tah-rah-boh It's a big name for a small temple on the river road. Sambor Town, Kratie is one of the well known Tourist Attractions in Kratie. This is the most ancient Hindu state of Indochina, whose history goes back to the 1st century A.D. The Sambor Town, Kratie is known by the name of Fou Nan which was given to it by the Chinese. 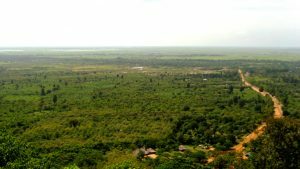 The capital of the Sambor Town was positioned in the present Cambodian province of Prey Veng. The dynasty claims to have traced its origins from Brahmane Kaundinya, who had come from India. The Sambor Town, Kratie dates back to the Sanskrit registrations which date back to the 3rd century AD. This structure comes from the Chinese texts. The first embassy of the Fou Nan in the court of China dates of the year 225. The Fou Nan Empire collapsed in the 6th century, under the pressure of the vassal state, Kambuja to the north of Cambodia. 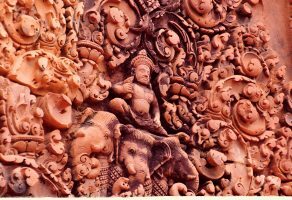 One of the kings, Icanavarman I, based his capital at Sambor Prei Kuk, for which tourists admire the ruins at the Sambor Town 30 kms northeast of Kompong Thom. 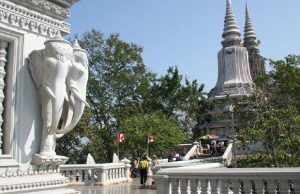 Sambor Town, Kratie is a pleasant tourist getaway in all respects. The Sambor Prei Kuk is a temple dedicated to Lord Shiva. It has 3 complexes, surrounded by two walls. There are bricks towers, done in a variety of forms, such as oblong, square and octagonal. Each tower is ten meters high and ten meters wide. The brick is finely sculpted in sturdy relief. The decoration is an inspiration of typical Indian architecture. (In India, the lion is often represented, but this animal does not exist in Cambodia). The door frames are done in stoneware. 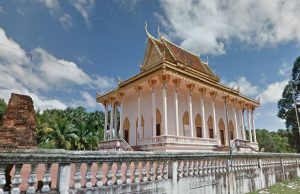 The temples at Sambor Town, Kratie go back to the beginning of the 7th century AD, 600 years before the construction of Angkor Vat.